Apple is considered one of the world’s most valuable companies and brands that investors can buy into. They company is currently riding one of their highest ever stock prices amidst growing iPhone 5 rumors, a similar situation to what happened prior to the release of the new iPad – and then the stock price tanked when the device was announced. 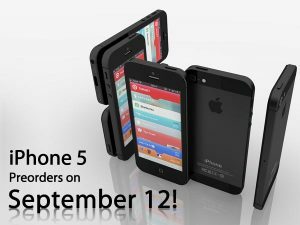 I believe the same is going to happen on the iPhone 5 release date. The main reason that the new iPad caused Apple stock to take such a hit wasn’t because it was an inferior product – it just didn’t live up to the hype. The iPad 3 had the retina display as expected, but months of pre-launch hype made consumers and investors expect so much more. As a result, Apple’s stock price took a dive until the company released a series of massive sales to bring the price back up. That precedent is once again present, although on a much larger scale. While the iPad is a great device, it plays a relatively small part in Apple’s overall sales figures compared with the iPhone. More people own, and can afford an iPhone, as opposed to an iPad. This makes the hype even stronger as we near the upcoming iPhone 5 release date because there is such a larger consumer base that is interested. But the fact is that iPhone 5 will not live up to the hype. People are speculating on wildcard iPhone 5 features like fingerprint unlock that are unlikely to end up in the retail product. Apple won’t try anything drastic when minor improvements have been all that’s necessary to generate millions of sales. But you can’t blame Apple for not living up to the hype surrounding the iPhone 5 release date, there’s not a manufacturer on the planet that could live up to the expectations of a tech-obsessed web. The bigger issue, however, is expectation. Apple’s stock took a hit last quarter in spite of incredible sales numbers because they were lower than what was projected by analysts. While the hype surrounding upcoming Apple products like the iPhone 5 and iPad Mini gives the company a huge (and free) publicity boost, they are simply unable to deliver a real-world device that lives up to the rumor-mill hyperbole. So when the iPhone 5 release date comes around on September 12th – keep one eye on the keynote, and one eye on the stock price. There’s a good chance the iPhone 5 will be playing it safe, but there is no doubt that the device will still have incredible sales that push the Apple stock price skyward. And if not, there is always the iPhone 6.